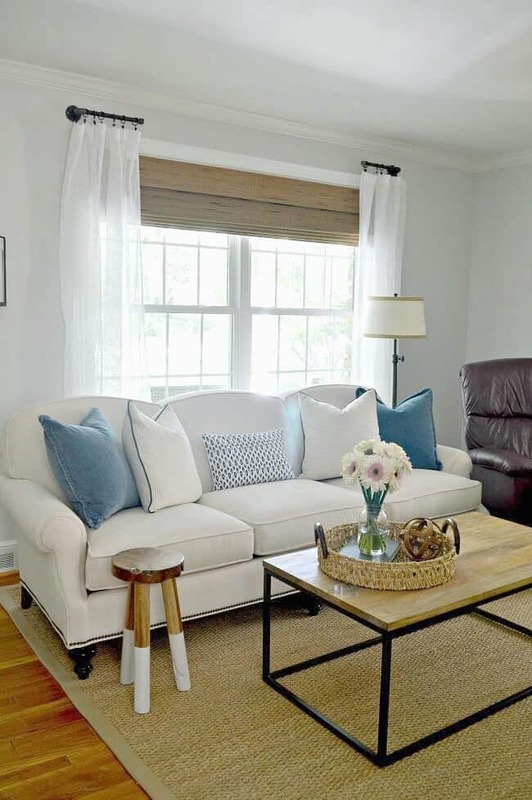 Check out these 5 tips for small space living: living rooms. We’ve lived in 10 different homes during our marriage but this home, at just under 1200 square feet, is the smallest. Our house in Florida was just a bit bigger but seemed much larger than this house. I think it’s just the way this house is laid out that makes it seem so small. Anyway, learning to live with less space has definitely been a challenge. I’m not big on collecting and I have no problem letting go of unnecessary items, so that has been a big plus, but I have definitely had to scale back. I thought I would share some of the things I’ve learned this past year starting with the living room. 1. 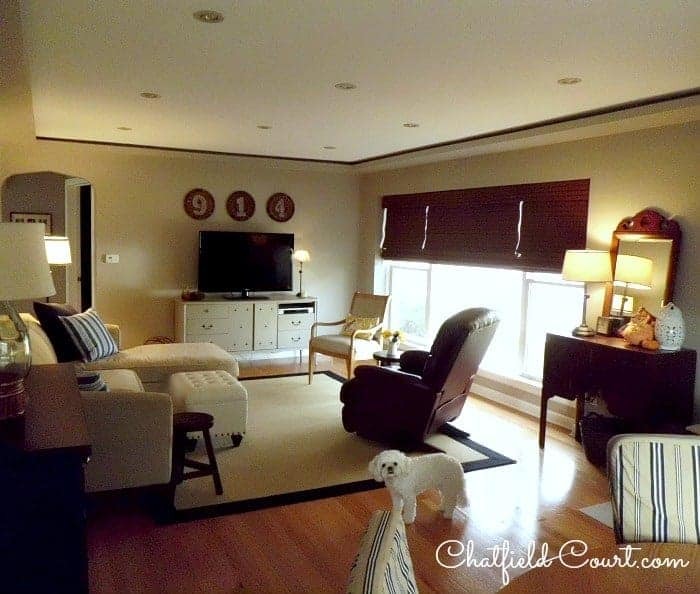 Our living room may look large in photos but it’s combined with the dining and entryway. The actual living area is small but it has a large window which helps it look bigger. It also faces North which means we don’t get a lot of light. So, to keep the room from looking closed in and dark, I ended up dressing the window simply with bamboo shades and no curtains. 2. Because there isn’t a lot of surface area for decor, I have to be very particular about what I buy and display. I’ve learned that if I see something I like, I need to be really sure that I have a place to put it. I’ve had to pass on a lot of things I really liked but it is, after all, just “stuff” and I’ve actually saved a lot of money by not buying. 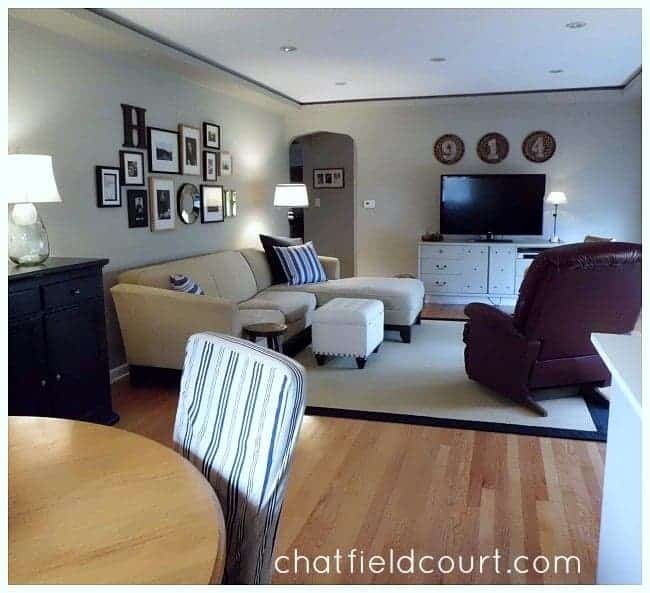 Having a lot of things in a small room could also make it look small and cluttered, so I try to choose larger items rather than lots of little things to display. 3. I have had to find furniture that I could use for extra storage. The cabinet that the tv sits on also houses my camera equipment, our cable box, wii, dvds, cds and lots of other stuff that I like to keep out of view. I got an ottoman from Target that also has storage and I put a few blankets in there to use on those cold winter nights. You’ll also notice that I haven’t used any end tables. I tried, but they just didn’t work in this room. Instead I use the ottoman and a few wooden stools so we can put drinks down. I love double-duty furniture. 4. 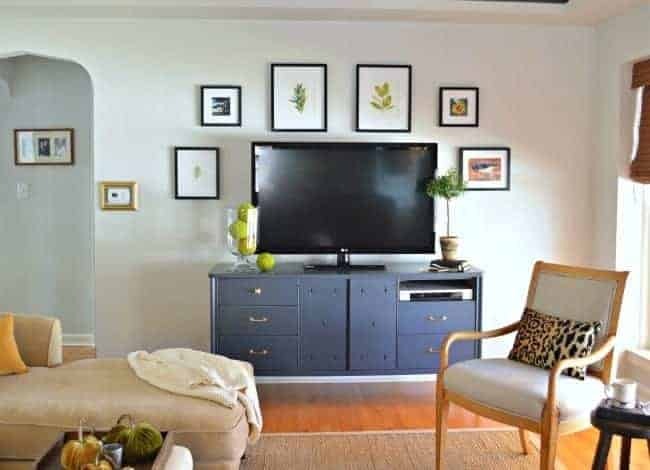 My next tip would be to paint your walls using light colors to help the space look bigger. I painted my living room with BM Thunder and it turned out to be too dark for the space so I had to repaint. After the awful winter we had, the color just seemed depressing to me. 5. 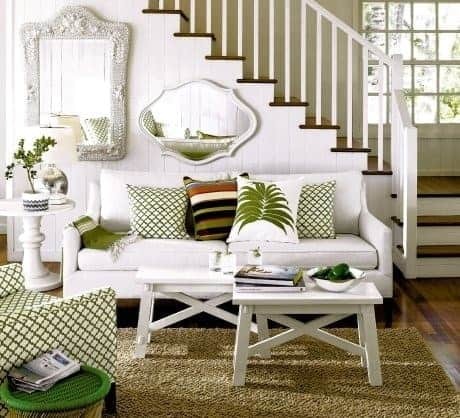 I have found that using mirrors in my small space definitely helps to open it up and adds extra light. I’ve used three in my room and I think it makes a huge difference. That’s my 5 biggest tips for the living room. There are many more and I hope to touch on them as we move on to other rooms. Of course I’m still learning so if I come across anything, I’ll definitely share. 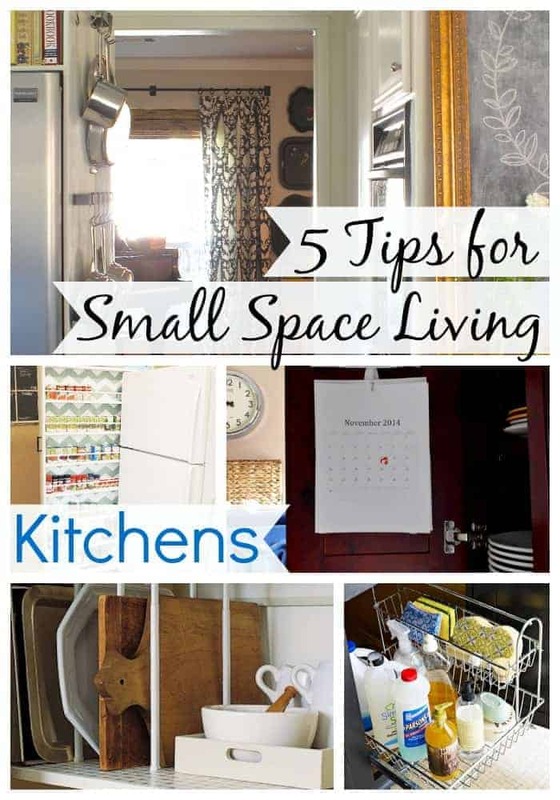 Do you have any small space living tips? Do tell. 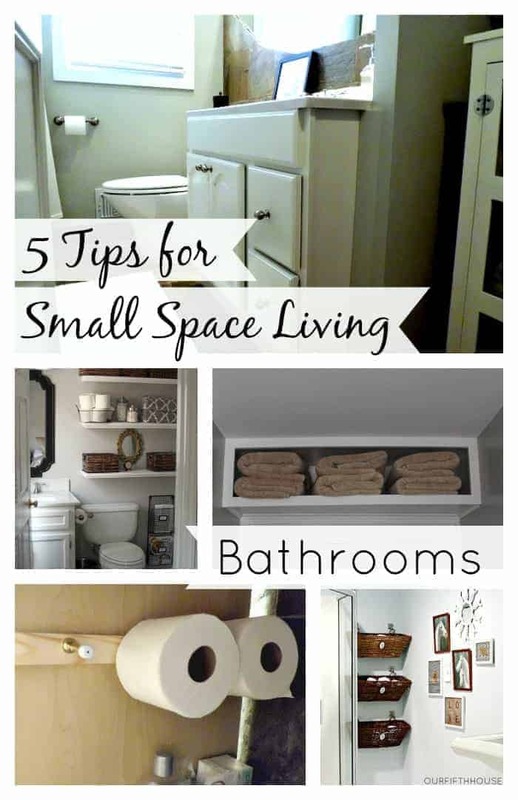 Check out my other small space living tips for bathrooms and kitchens. Thanks for sharing this! I love your slipcovers. Where from, or are they custom made? Thanks! Nah, no blog here! Thank you for your kind comment. I did enjoy reading the post, and it is a very good site. I have heard friends say “I wish I could….” or “if only…” about getting nice things in their home, the size of the space, and not recognizing how creative they really are and could be in their homes. My friend thinks thst way, and she was a little envious of my coffee table itself and the decorating on top with items I had, thinking I had spent a fortune on it, but it was just $33, like I mentioned, and that was achieveable with her budget as well. I lucked across it in that thrift store. It could have been her finding it! I just used things I already had on top of it to decorate, and I got pretty coasters for it. It looks nice, but she could do that, too. Great tips! I have a small living room (and small apartment ), but things do feel spacious. I got exactly the furniture I wanted as if I lived in a house, not getting “placeholder” pieces, but what I would choose for a house. In an apartment, because an apartment tends to exist as a temporary living situation, I think people make a big mistake in buying “for” that apartment and think they need to wait on special things until they are in a house. I bought what I loved. I had come across a beautiful coffee table I adored, but I lived before in an even smaller apartment where I could not put it in the living room. I sat it in a corner in the bedroom and it was not used as anything but something to prop my artwork on. Well, I moved into my current apartment where I have room to use it as a coffee table, and I am so glad I purchased it. It was $33 total, solid wood, and it was worth $600. I found it at a thrift store. I know there are logistics of “now, that REALLY won’t fit, ” and a sofa that is too big to get into your place or a huge hutch and buffet for a tiny apartment kitchen ARE unrealistic and not a good buy, but there are beautiful things that are worth it (like the coffee table ) that are special but can be made to work in the spaces. It doesn’t even have to cost much, and you don’t have to be rich or a professional decorator. I think, too, that beautiful details or decor can really distract the eye from the small size of the space. You can do a lot cheaply, too. I love thrift stores for that! I just found a wonderful wood farmhouse dining table at a thrift store to go with my four upholstered Target chairs i alrrady had, and though the kitchen space for the table and chairs is slightly too small, that is an apartment layout issue. The “3 inches too narrow “layout of the apartment was not a good reason to pass on such a great furniture piece. I will be using it for many years to come, and I believe I will be living in a house where it can certainly be used later on, too. The slight awkwardness of the space I will just live with! It was worth it! My bed is a queen, and really a full might have worked better for an apartment bedroom, but I am 5 ft 10 and that will always remain the case! I want a big bed. My bed takes over the bedroom, but I got a pretty upholstered headboard and frame and have made it more a feature in the room instead of it being something that is “too big.” There is room to get comfortably around it and around the room. I think the quality furniture just makes everything look and feel better! Thrift stores are a terrific option for this. I did have a friend give me my loveseat free, which was such a blessing. I didn’t put any money really into the art and decor objects much. I made the paintings and drawings myself and use what I have. I think if the budget is tight, the furniture is the way to go. I got a $46 plaid Broyhill armchair worth $700, a $212 ladder pottery barn bookcase worth $898, the coffee table for $33 worth $600. The farmhouse dining table I paid $100 and I am sure it is worth more. This has taken years to acquire, not overnight buys. Wow Tracy, thanks so much for sharing. 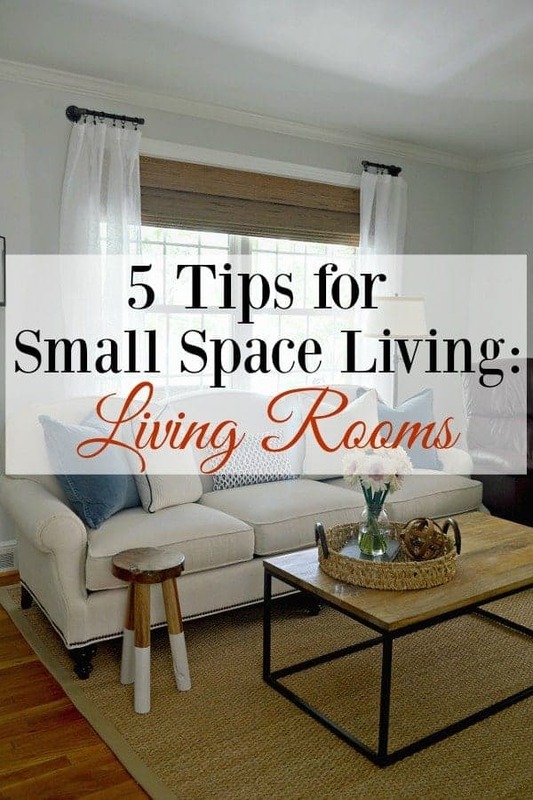 I love to hear how others live and decorate in their small space and it sounds like you know what you’re doing. 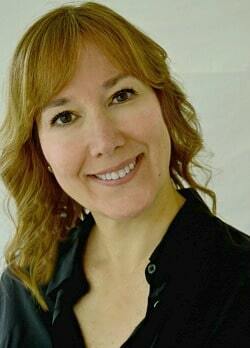 Do you already have a blog? 😉 I like that you shop thrift stores and buy only pieces you love. I think that buying what you love, on your budget of course, is the way to make your home beautiful. Thank so much. I have tried each ideas works greats. That’s great Shennice! Thanks so much for stopping by. Amazing! The whiter the brighter and it looks so clean and tidy. Not to mention inviting! 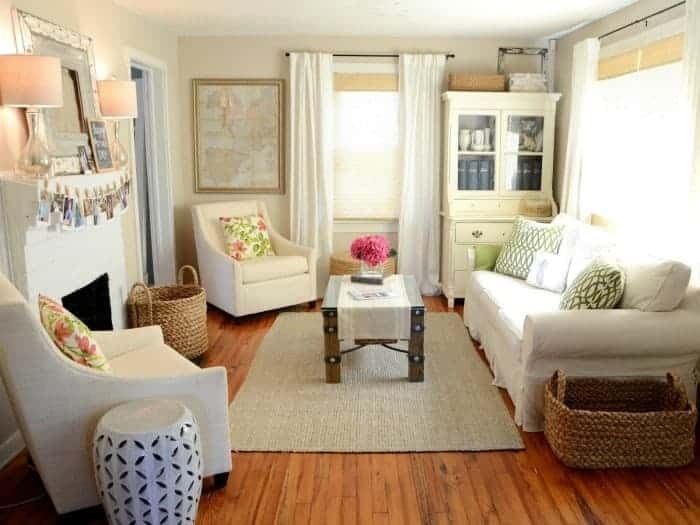 Im inspired to lighten my paint and lose a lot of small clutter.Great pics! Great tips! I’m always trying to create a feeling of more space in my living room. Love the decor in the pics too. Thank you Brooke! I seem to always be moving things around to create a more spacious feeling. LOL I appreciate your visit and comment. Oh I am so learning little by little how to survive in a small space. Great post. Thanks tons for linking to Inspire Me. Thanks so much Marty! I appreciate you hosting Inspire Me every week. It certainly is a challenge living in a small space.